Growing up Jewish I learned early that not everyone would be accepting of my religion. I have memories from my elementary school days of our synagogue being defaced. One year right before Chanukah vandals painted swastikas all over the front of the building. Everyone that passed by the prominent doors of our place of worship were reminded of the hatred that was still pumping through the veins of some people right in our community. This scared me when I was a young child. I actually asked my parents not to put our Chanukah decorations in the window. Why you ask? It was simple, in my little mind it was for our safety. I figured if nobody knew that we were Jewish, they would leave our house alone. I was proud of my Jewish customs, but wanted them to be hidden. Each year I was always the student that asked for an alternate project to complete in art when all of my friends made Christmas decorations. Along with this, I would always bring dreidels into school to teach my friend how to play along with me for M&Ms. Of course, as bad as that was it was only the start. Just before my brother was to have his Bar Mitzvah (I was in high school) something more heinous occured at our synagogue. One evening on the news we watched as our Shul was on fire. Someone had gone in and started a fire on the Bima of the main sanctury. Whoever it was that started this fire knew exactly what they were doing. They were clearly targeting the sacred area of worship. The brave people of our local fire department went into the building to fight the fire. In addition to this, they rescued the Torahs and other precious items that were in the area. I still recall seeing the news reports with the firemen in their gear carefully holding the Torahs in their arms. It took quite some time for them to fix the damage that had occurred from the arson at our synagogue. Of course, thanks to that event things have never been quite the same. Security cameras are now all over the place. In addition to this, there is a motion detector with sirens that protects the sacred area of the building. An even bigger change is the police presence on the High Holidays. My children will never know of anything different. Each Yom Kippur and Rosh Hashanah there are now several police vehicles that surround the building. They guard the entrances of cars near the building and survey people that approach. Thankfully nothing has ever happened YET. Yesterday I sat at the computer working on something. Suddenly an item on Twitter caught my eye. There was a shooting at the United States Holocaust Memorial Museum. Immediately my heart sank. I knew that it was a crime of hatred. As the news reports have continued, we now know more about the monster that went into a sacred space and killed Officer Stephen Johns. Officer Johns was a hero, along with the other officers that helped to save the lives of countless others visiting the museum. These brave people, who were doing their jobs, shielded everyone from this person THING that has helped to spread his vile views to others in the world. The evil that has been uttered by this monster deserves no further recognition. Today our country is on high alert. As we mourn the loss of Officer Johns, we must now brace ourselves. Will there be copycat attacks? Do we have to worry about entering our places of worship and look over our shoulders when we visit places like the Holocaust Museum? Only time will tell. For now, we must do what we can to make sure we spread the views of tolerance. We must learn as much as we can about other religions, cultures and people of the world. Our children and future generations must learn from the mistakes of the past so that it does not happen again and again as it has. Please read this beautiful article written by Mark Blumenthal called This is Personal. Make a promise to yourself that you will help to make a difference. Remember to live and teach tolerance. Beautifully written Angel! I admit I am a bit ignorant when it comes to different Jewish customs but I respect your customs and ways. 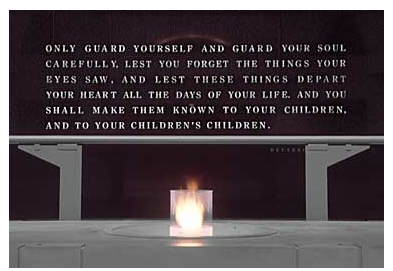 When I think about the Holocaust I always tear up. It makes me angry that there are still people in this world that believe and spread the lies that it never happened. I will teach my children of the suffering that the jewish community has suffered and continues to suffer as people continue on their hateful and disgusting path. It is a horrible thing that happened yesterday. That man, well let me rephrase that because there is nothing man about him, thing needs to rot in jail for what he did. I was so furious when I heard that yesterday. I mourn with your community – and join in the millions of others that do as well. QC Mama said everything else I would say. It’s terrible what people do in the name of hate. It’s actually worse than terrible, but I can’t think of a more severe word right now. And it’s amazing to me to think there is police security during High Holy Days. It’s so sad that people are filled with that much hate.